Map showing location of Okoroire Hot Springs Hotel . Use the controls on the map to zoom in and out. Had a lovely, short get-away at the Okoroire Host Springs Hotel. The heritage rooms at the hotel are lovingly restored, comfortable and very spacious. Over the past 18 months a lot of work appears to have been put into the hotel and its surroundings. The hot pools truly are a hidden gem! Enchanting, mesmerising and in a beautiful, private environment, surrounded by lush green bush and Waimakariri River, they truly deserve the name fairy pool. 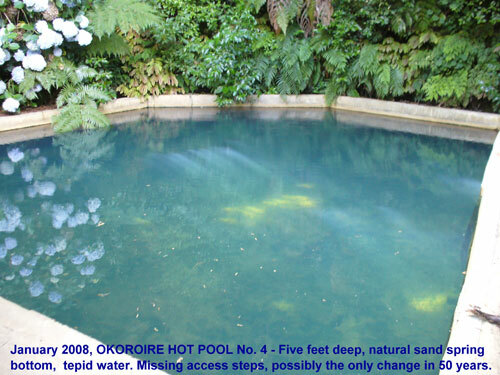 The fairy pool with its sandy bottom was built in 1887, and was New Zealand's first concrete pool apparently. A lot of work has happened, and still is happening, around the pools, and are surely worth a visit and a stay at the hotel (under new ownership). Wonderful to see an iconic colonial hotel (where my grand parents have stayed in the 20's) with wonderful healing waters unique to NZ. Pools are still in the 1920's Small hotel rooms nice with wonderful atmosphere in dining room & pub. Went to the so called "hot springs" they were totally disgusting! Run down and tired! The water was fifthly and luke warm. There were empty wine bottles everywhere, the toilet stunk of urine and faeces and was broken (out of order) $15 for both of us, I wouldn't pay 50c! We got in and out of the pool within 2mins we left, these hot springs and false advertising and very misleading as per the road signs, would strongly advise to go look at the pools before you pay, or even better wouldn’t even waste you petrol driving there. When we left and took the key back the lady she could tell we were not happy, and said to us (with her back to us) “leave the key on the desk” No thank you goodbye or anything very poor customer service! Very unhappy! The place needs a visit from the health Department, in fact we are thinking of contacting them ourselves. 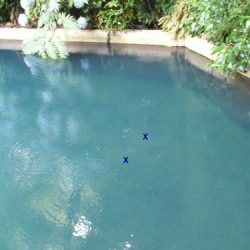 old facillities but otherwise good family pools, we only saw outdoor one.it is deep so need float aids for kids under 1.6mtrs. nice temp. hot water comes up from floor so sandy. seems odd at first but actually clean and clear. there is a stone near the steps so watch your toe!! it brings back happy memories of when we would go there and jump in the hot pools late at night so we should all be thankful that we have these things in our lives instead of complianing as kiwis usually do. after a few drinks we decided not to drive tha car so a warm dip was the answer and safer. 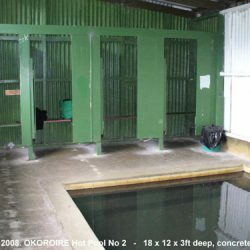 5 of us stayed at Okoroire Hot Springs Hotel and found the experience to be terrible the rooms are tiny and over priced. Bedrooms barely fit the double bed, the shower and toilet are tucked into a small room. The onsite pub meant that there were loud guests who woke us during the night. The staff member was drunk when we arrived and gave us very little assistance to find our rooms. Would not stay here again or recommend. Extremely good. Bit of New Zealand history. Superb surroundings nice and quite. No what I really expected, but a nice hour soak, shame nowhere to sit, no shower, and in need of a decorate. do go on a thursday as they are cleaned out Wednesday. Over that past 2decades,I have taken a number of signifigant others to enjoy the delights offered by the enviroment, all enjoy the way it makes them feel to be in such a place of beauty, no worries ever of head going under,or privacy invaded during amour ! The focus in this business is the hotel and golf course. I asked the Boss about the camping ground. "down there on the other side of the road." I asked about the pools. "private pools down by the stream. Looked over the camping ground and could see only one power box. Walked up the stream from the bridge found dilapidated iron fence, concrete pool a third full of grunge, another visible pool with bad water. 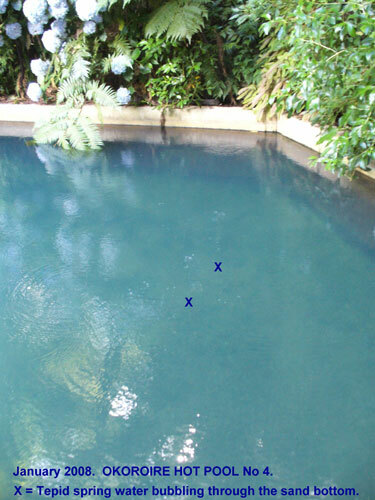 We were the only ones in the pool and can understand why when you see the condition of the area. The water was warm and deep but difficult to avoid all the floating debris. Very run down with graffiti on the changing room doors dating back to 2005 and no working toilets. Needs a good lick of paint and some TLC. Otherwise worth a visit. 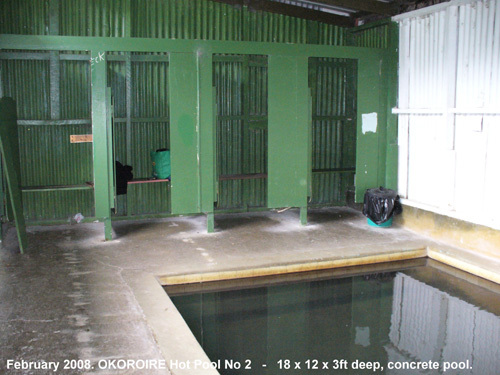 Went back to Okoroire Hot Springs 24 Feb 08, 10 to 11 am. 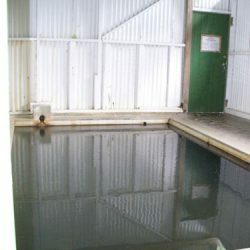 Was keen to try out their number 2 pool. It's on a higher level and is all concrete. 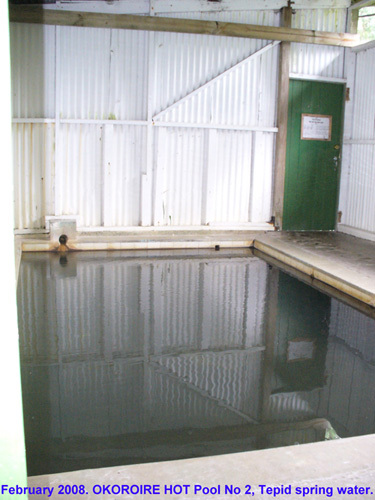 On my last visit I hired the No 4 from 10 am to 11 am and upon leaving a cleaning crew had opened up the door to the number two pool building and had drained the pool. They were in it brooming it out. Yesterday I discovered this action is (only ?) done on Wednesdays. That would explain what looked like quite a bit of fine debris floating (skin flakes) in the water, adding to what is naturally coming through from the embankment spring. Ideally it should be drained more often, and in line with usage. Maintenance on this unit was also very poor. Generally all is poor. Vandalism has accounted for one of the former two, toilets that stand alone in a separate building, so now one acts as unisex. No attempt has been made to paint out the graffiti. It looks like the local hoons delight in breaking in to the pools for a free swim. Bashed wall panels, broken security netting and the like. A pity because it has great potential, if the issues that are holding it back from modernisation were resolved. For what ever reason there is no incentive for the operators to keep them pristine like the Hotel, it's grounds and the golf course. It's location, so close to the river, would lead me to believe they do not hold title. Possibly relying on historic use (squatters rights ?) There would also be issues with their septic tank. 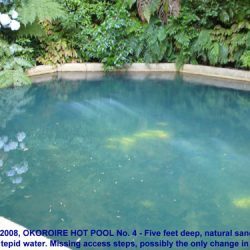 I have an elderly friend at Tokoroa who could benefit from hot water exercise, but with every possibility of amoeba being in the water, and most importantly, no longer access steps into the big five foot deep pool, where he could benefit from supported walking exercises, we will not be going there. A pity because they are quite close. 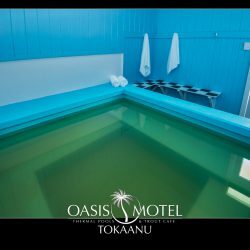 At this time Te Aroha, where he likes the hot tubs, is too far a drive away. Have been in the big pool at the end - it's basic but surrounded by native bush and the sound of the river running alongside. We were there at dusk and as the sun went down the gloworms start to shine - quite simply, a magic New Zealand experience. good to jump over the fence for a night time dip after a few or many drinks. Wouldn't advise putting your head under the water and watch out for things on the bottom!